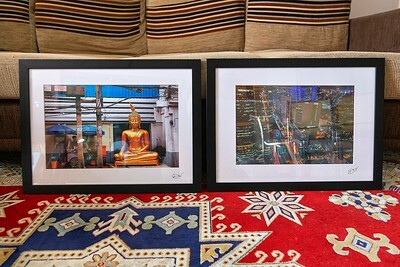 I offer 12x18 inch prints on silver halide paper from the best print lab in Bangkok, signed by me on the back side. I'll print any photo from my website portfolio or social media. 1.EMAIL ME or click 'Contact' on the left & attach a screen shot or description of the image you'd like printed from my portfolio - Instagram - FB Page. 2. I will send you a PayPal payment request for $65 for the first print, $55 for any additional prints. The pictures will be mailed within the week & any tracking info will be emailed to you. EMAIL ME with screen shots or description of the image or images you would like printed & your shipping address. A single print is ฿1700 THB & additional prints are ฿1500 THB each. It will be mailed via Thai Post EMS within a few days, tracking info forwarded to you via email. This is the only way that I offer prints as I know the print lab well & trust their quality of work. I want to make sure that the prints are the best available.